As much as we love caring for our mobile devices, there are times where we would go the distance and get some kick out of a video showing an expensive piece of technology being obliterated just for entertainment purposes. Today we have stumbled across a video showing what happens when an iPhone 6s meets burning hot molten lava. That’s right. Lava. The video comes courtesy of TechRax on YouTube, who is known to do all sorts of crazy and dangerous things to expensive gadgets, and it’s time for the iPhone 6s to take the heat – excuse the pun. In the video, the iPhone 6s comes face to face with hot molten lava, and the results are, well, annihilating. As you can see from the video, the iPhone 6s is no match for mother nature, and the new Aluminum 7000 casing is no match in front of the hot molten lava. When tossed into lava at first, it appears as though the iPhone 6s is not taking any sort of damage, but after a few seconds the smartphone instantly catches fire, with the screen and the rear shell coming apart, rendering the device absolutely useless. See, the entire experiment is somewhat illogical as most of you would already have concluded what would happen when any gadget is tossed into lava. 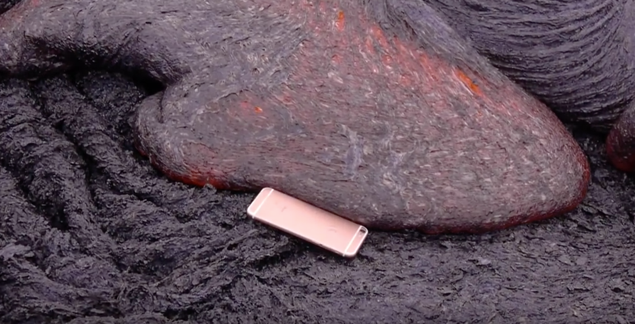 But the takeaway lesson is a rather simple one: don’t throw your iPhone 6s into lava. It’s absolutely crazy and your device doesn’t stand a chance by any shot. You just can’t play around with mother nature when it comes to such things. While an iPhone is no match for lava, but that doesn’t mean that we stop caring for our devices to keep it from harm’s way. We highly recommend that users take extra precaution whenever they’re going out and about with their precious investment sitting inside their pockets. A simple case can go an absolutely long distance in protecting a device from a bunch of things. For instance, it came to our knowledge a while back how a simple waterproof bag saved an iPhone 6 Plus from getting spoiled while sinking to the bottom of the sea. Therefore don’t underestimate the power of a simple case and what it can do for you. Have you ever come across a dangerous situation like the one shown in the video above? If yes, then don’t forget to share your tale in the comments section below.